A Rubrik R334 (3-node, 36TB) unit list price is around $100,000 MSRP. A Rubrik R500 Series Node (10GbE Dual 10GBaseT NIC, 800GB SSD, 8x16GB DIMM) will cost of around $115,000. 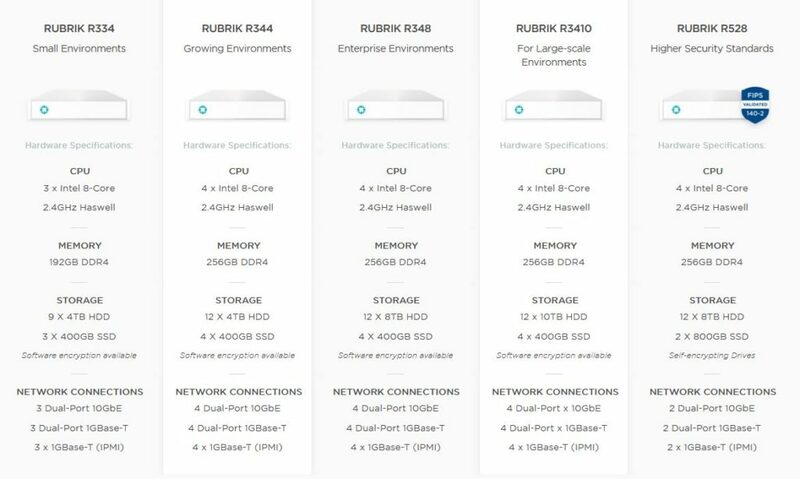 A Rubrik R344 appliance (4-node, 48TB) has budgetary pricing of around $200,000. Rubrik Backup Appliances along with Cohesity are tackling the enterprise backup problem with Simplicity. As anyone will tell you, enterprise backups have a high cost and you never really know if they are going to work when you need to restore something. Rubrik and Cohesity are making it easier and more reliable and review and comparison should be explored. While the R3* series are more suited for smaller business or remote offices, they still possess the power to provide rock-solid backups.